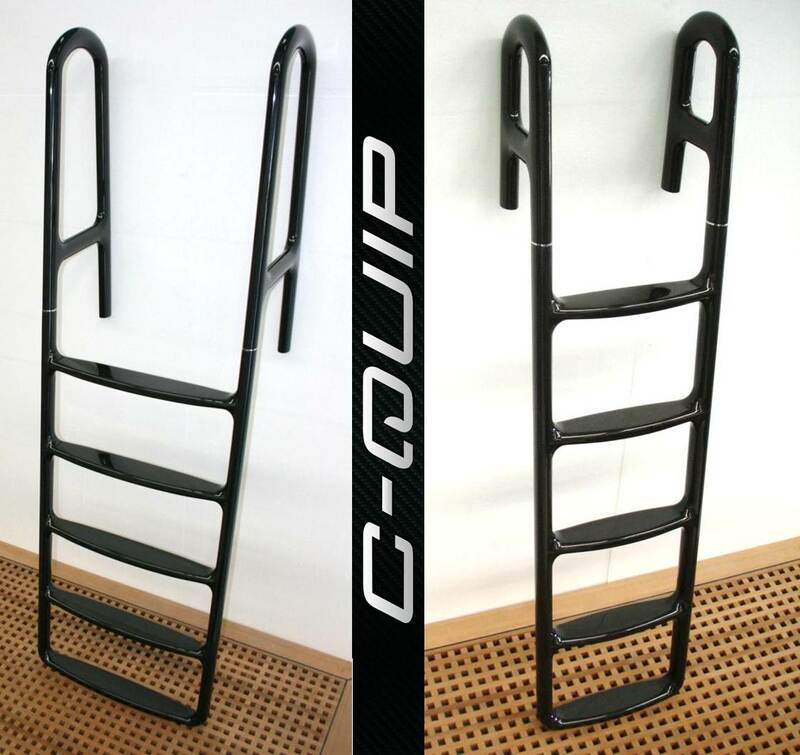 Auckland-based C-Quip has introduced a new range of carbon fibre swim ladders for yachts and has also developed a light, but robust carbon fibre pilot ladder. The C-65 model swim ladder has a centre line width of 650 mm and overall width of 690 mm; it weighs only 11 kg with a safe working load of 150 kg. The C-40 model has a centre line width of 400 mm, an overall width of 440 mm, low profile hoops, weighs just 9 kg with a safe working load of 150 kg. “Carbon fibre has long been recognised as light in weight and high in strength, and it’s proven in the marine environment to eliminate corrosion or degradation while maintaining its original smooth finish and appearance,” says Hackett. The pilot ladder is made up of 600 mm wide clear carbon fibre treads with non-slip finish. Spreader bars can be attached to the standard treads with quick release pins to make a total width 1800 mm for stability. The spreader bars can then be detached for compact storage. The steps are clamped to side ropes by lightweight and durable glass filled nylon rope clamps. The side rope is UV-resistant, low stretch braided polyester. Each step rests on the hull with integrated urethane bump pads to prevent any damage to the hull paintwork or carbon fibre tread. The length of the pilot ladder is manufactured to your requirements, up to thirty steps in length.